How do you create a whole new market for your product, and then dominate it? Just by web design or SEO? No – By Being different. By going against the common conception rather misconception. That’s what Miller Lite did. The common misconception was that you couldn’t drink a light beer that actually tasted good. Miller Lite took on the debate, and in every ad featured two manly idols declare, which was better –Great Taste, or Less Filling. And with Miller Lite, the first-ever beer in the light category, you could have both! For decades after this campaign launched, Miller Lite dominated the light beer market they essentially created.Great Taste, Less Filling campaign, which began in 1974 has been one of the most memorable and successful campaigns of all time. Advertising Age magazine ranked it as the eighth best campaign in advertising history! McCann-Erickson Worldwide developed the advertising campaign. The television commercials typically portrayed a Miller Lite drinker noting its great taste followed by another who observed that it was less filling. This usually led to a parody of Wild West Saloon fights in which every patron got involved in the dispute for no real reason. 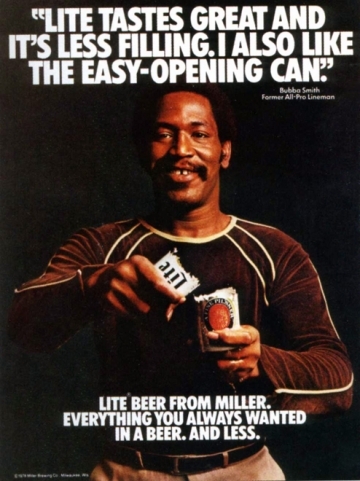 The commercials were closed with a voiceover from actor Eddie Barth, who read the slogan,Lite Beer from Miller: Everything you’ve always wanted in a beer. And less. Early in 1999, Miller dusted-off the 25-year old formula of having people debate the merits of the brand, Great TasteandLess Filling. The company felt that the less filling claim had lost its uniqueness as other light beers have entered the market. The ads changed their focus on Miller Lite’s taste and ingredients. Probably the eroding market share in the subsequent years prompted the company to revisit its success formula. Miller has revived the best-loved theme of their 38-year old original advertising theme –Great Taste, Less Filling in 2008.